One thing we can all agree on: Nobody likes dry chicken. Fortunately for us cooking delicious, juicy chicken is a lot easier than you might think. Let’s get to it! Before we get to the chicken though, let’s talk spice! 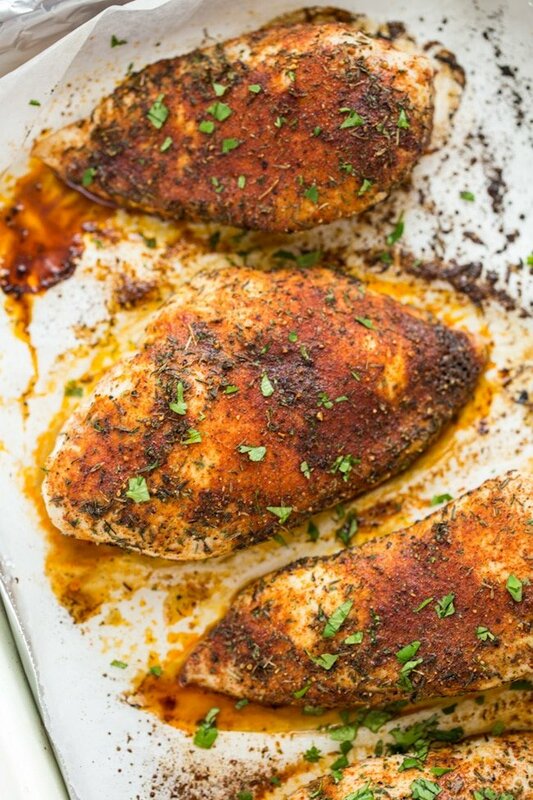 This recipe uses a very simple spice blend that you can mix together in seconds. It will probably take more time for you to gather the spice than it will to actually mix them together. 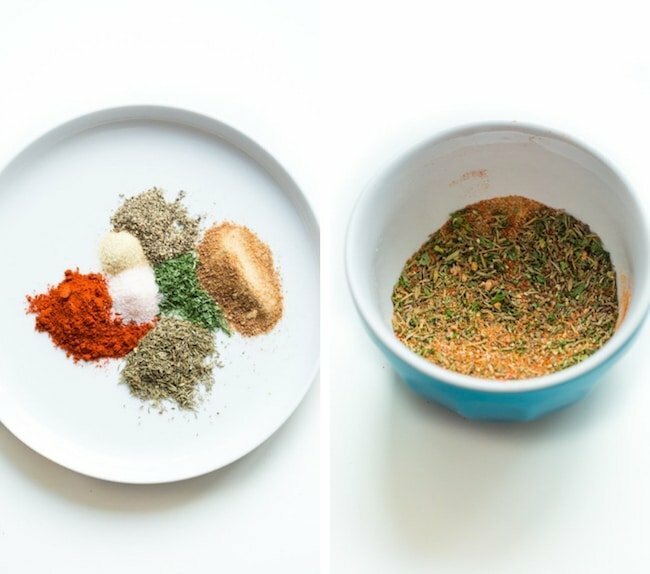 The spice blend is pretty versatile – you can even go in an entirely different direction with your chicken flavour if you have another blend in mind. If you’re not comfortable playing around with different flavours just yet then I recommend using a pre-made spice blend. Pounding will help soften and tenderise the meat making it easier to chew and enjoy. It helps to create an even thickness which will make it faster and easier to cook evenly. If you don’t pound it out, or slice your chicken in half width-wise before baking don’t be surprised if your cooking time goes up quite a bit. Also keep in mind that different sized chicken breasts will cook differently. Chicken breasts tend to run about 4-6 ounces in size. Smaller breasts will naturally cook faster and larger breasts need a few more minutes. Check for doneness at the 18 minute mark. Ideally you’ll want to use a meat thermometer (<–amazon affiliate link) so you can check an exact temperature without cutting into the meat prematurely. When the internal temperature reads 165°F/74°C you’re good to go. Once completely cooled, store these in an airtight container for up to four days in the fridge. 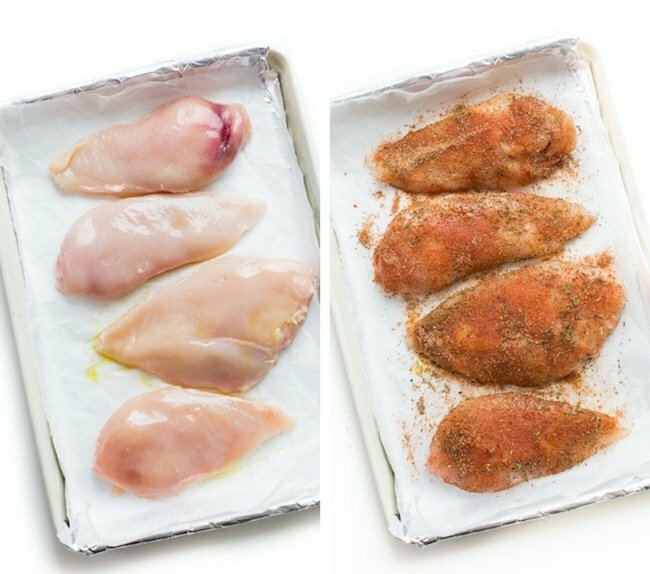 How to freeze baked chicken breast? Wrapped the cooled chicken tightly in aluminium foil or plastic wrap and then store the wrapped chicken in a sealed, freezer safe bag. This should keep 2-3 month in the freezer. To defrost, leave in the fridge overnight. 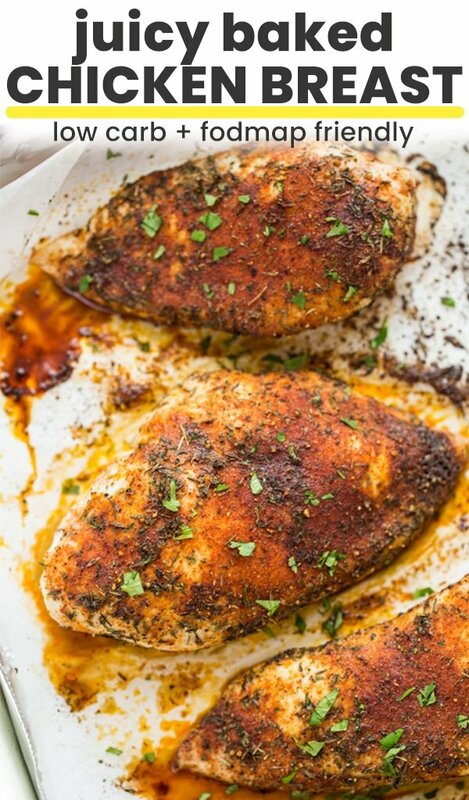 Don’t forget to #asaucykitchen on instagram if you try this Baked Chicken Breast! We love seeing what you make! You can also post your pictures to my facebook page! Preheat oven to 425°F/220°C. Line a large baking sheet with foil and/or baking paper for easy clean up. Set aside. Mix together the spices in a small bowl. Place the chicken breasts between two pieces of plastic cling wrap or aluminium foil and pound them down to make them even in thickness. You can use a rolling pin if you don't own a meat mallet. This will help the chicken cook faster, more even and make for more tender chicken. Place the chicken on the lined baking sheet - make sure not to overlap the chicken. Drizzle and rub olive oil all over the chicken. Sprinkle the seasoning blend and rub all over the surface of the chicken. Try to cover as much surface area as you can with spice blend. Bake in the preheated oven for 18-20 minutes or until cooked through. 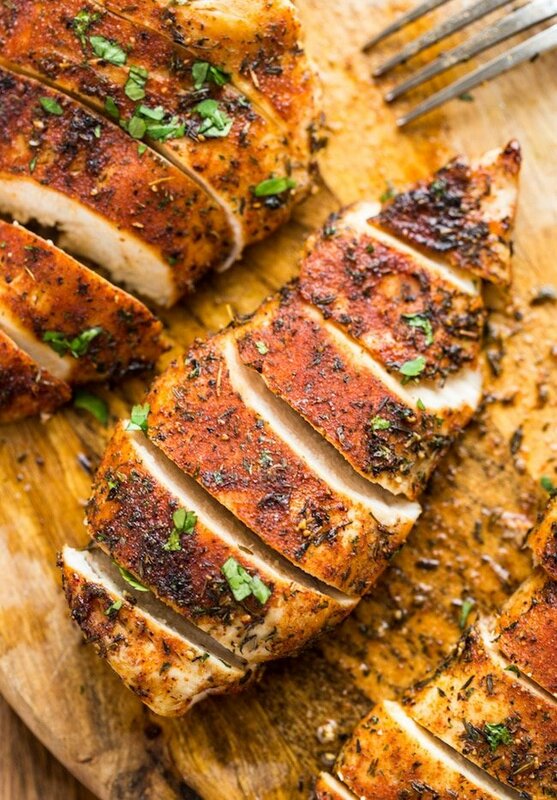 The internal temperature of the chicken breast should be at least 165°F. Cover will a piece of foil or a bowl and let rest 5-10 minutes before slicing and serving. Enjoy!